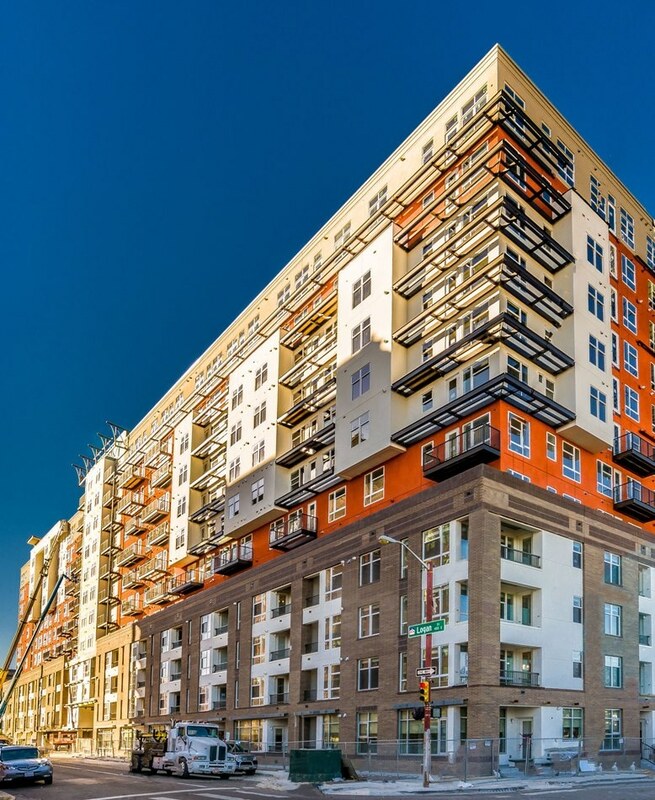 Prescient, a fully integrated and patented design, engineering, manufacturing and installation solution for the construction industry, announced today an ongoing partnership with Trammell Crow Residential (TCR) and the completion of two innovative apartment projects in Denver. Alexan Uptown is Prescient’s tallest structure to date in Denver. The 12-story, 372-unit apartment building features more than 450,000 square feet of total building area and consists of eight stories of Prescient structure on top of a four-story concrete podium. The project, owned by Trammell Crow Residential, was contracted by Martines Palmeiro Construction, designed by Kephart Architects and engineered alongside Anchor Engineering. TCR and Prescient’s second conjunctive apartment project, The Alexan Cherry Creek apartments, boasts 156,000 square feet of Prescient structure. The eight-story building includes 164 units. The project was completed in partnership with architect Shears Adkins Rockmore. “To date, we have finished two projects with the Prescient structural system and have three more in planning for 2017 and 2018. By embracing Prescient’s technology and standardized approach to design and construction we are seeing compressed design and construction schedules and a better, more cost-effective result,” said Schildt. “Working with Trammell Crow Residential on multiple projects has enabled our teams to fully utilize Prescient’s standardized design, engineering and construction platform. We’ve been able to optimize designs to work with our framing system, leading to significantly lower costs, better execution in the field and shorter construction schedules. Applying advanced design and construction technology to the construction process mitigates the typical risks associated with large multi-unit projects,” said John Vanker, founder of Prescient. Prescient, which recently expanded its 12-acre, 120,000 square foot Arvada, Colorado, headquarters and manufacturing facility, is on track to complete 1.5 million square feet of projects during 2016. In February 2017, Prescient will begin production at its 10-acre site near Raleigh-Durham, North Carolina. The company is building a 135,000 square foot manufacturing facility to more efficiently service markets along the East Coast up and down the I-95 corridor from Maine to Miami and all markets east of the Mississippi River. “Prescient is fast becoming the urban-infill solution of choice in Denver. Our partnership with Trammell Crow Residential has been the cornerstone of our growth in this city, and we’re thankful for that,” said Satyen Patel, chairman and CEO of Prescient. In 2016, Prescient expanded its footprint with projects beyond Colorado, including Florida, Texas, Missouri and Nebraska. In 2017, the company will expand its presence with projects in Illinois, Indiana, Oklahoma, North Carolina, Georgia, Virginia, Maryland, Washington, D.C., Kentucky and Tennessee. To date, Prescient has finished 10 projects in the greater Denver area with several developers across a wide-spectrum of multi-family housing categories, ranging from market-rate apartments to student housing, hotels and senior-living projects. In 2017, the company has 10 more projects scheduled for Denver and more than 20 additional projects nationwide.